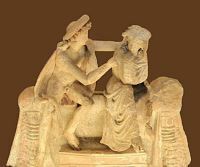 Those who have written about the life and culture of the Roman people say that women in Rome and Latium 'lived an abstemious life', which is to say that they abstained altogether from wine, called temetum in the early language and that it was the custom for them to kiss their relatives so they could tell by the smell whether they had been drinking. 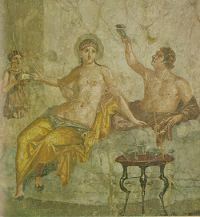 Women are said to have drunk raisin wine, myrrh-flavoured wine and other sweet drinks that were not as strong in content as traditional wines, but were still alcoholic drinks nevertheless. Marcus Cato reports that women were not only judged but also punished by a judge as severely for drinking wine as for committing adultery. Egnatius Metellus beat his wife to death with a cudgel because she had drunk some wine. Not only were no charges brought against him over her death, but he was exonerated of all blame. This was considered an excellent example of one who had paid the penalty for violating the laws of sobriety. 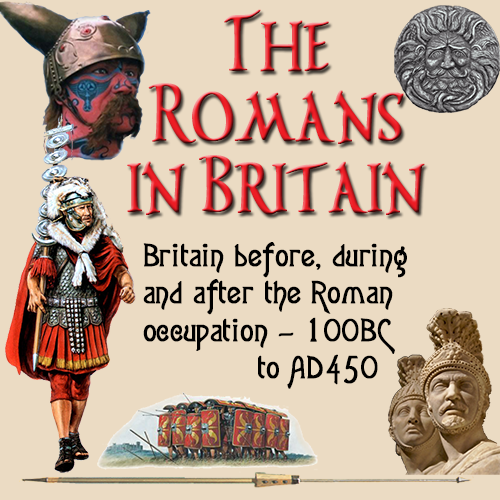 Quintus Antistius Vetus divorced his wife because he had seen her in public having a private conversation with a common freedwoman. Acting not by an actual crime but, by the possibility one was about to be committed, he punished her, so that he might prevent the deed being performed,, rather than punish it afterwards. Publius Sempronius Sophus divorced is wife merely because she dared attend the games without his knowledge.